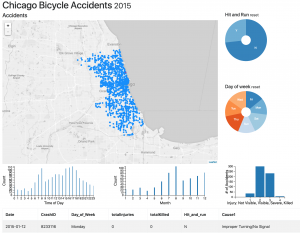 This is an interactive data visualization that allows intuitively deep exploration of a dataframe on bicycle accidents in Chicago. Day of Week, Time of Day, Severity of Accident, Hit and Run, and Month*, are both sub-plots and Interactive Filters that update a live Data Frame and Map. For example, we can see easily that afternoon rush hour is twice as dangerous as the morning, and the majority of 12-4am accidents are on the weekends. I don’t expect this to work on mobile – furthermore, please ensure browser is 1200 px wide for best experience. I enjoyed revisiting D3 and HTML5/CSS – I had not used it in a few years (finally ! 🙂 and it was a nice exercise while I was exploring bicycle safety for a different project. Prior to HTML/JS, the data filtering was done in Python and some exploratory statistics in R.
* For those keeping track, that’s 4 for 5 of LATCH taxonomy (Timeseries, Nominal, Part to Whole, and Geospatial).